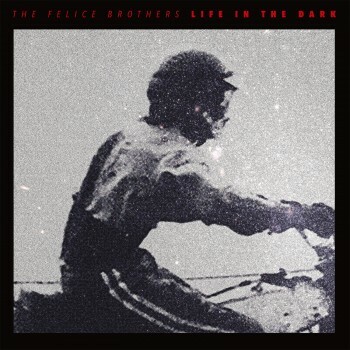 Hudson-NY, April 11, 2016 – The upstate New York band The Felice Brothers will release a new album, Life In The Dark, through Yep Roc Records on June 24 (available for pre-order now). Today the band debuts the lively, rousing “Aerosol Ball,” from the forthcoming release. With the track comes a video created by the band’s bassist Josh Rawson: an entertaining, re-purposed collage of stock footage from the 1950s and 60s, interspersing pin-up girls, boys stuffed in phone booths, mod-dancers and more. Life In The Dark was recorded in a rented garage-turned-recording-studio on Letterbox Farm, a working farm in New York State’s verdant Hudson Valley in Columba County. This album follows The Felice Brothers’ 2014 release Favorite Waitress, which American Songwriter hailed as “a remarkably varied and well-paced collection of tunes.” The nine new songs on Life In The Dark find lyricist Ian Felice continuing to explore modern life in a complicated and divided America, through a cynical and occasionally heartbroken lens, in the tradition of songwriters like John Prine, Shane MacGowan and Michael Hurley. Musically the band (Ian on guitars and vocals; his brother James on accordion, keyboards and vocals; Greg Farley on fiddle and Josh Rawson on bass) incorporates their expansive knowledge of American folk music — both its creators and what makes it so compelling and enduring — with other elements of contemporary music — classic rock and blues. The result which, has previously been dubbed “rowdy, vivid, moving and playful…just glorious” (Uncut), is in full-effect here on songs like “Sally,” “Plunder” and more. Watch the video for “Aerosol Ball” HERE. Pick up Life in the Dark in the Yep Roc Store on CD/LP, bundle your order with an exclusive set of post cards and t-shirt, or pick it up digitally.